CCL - Alb - Kush do t� m�i Fshij� Lot�t? 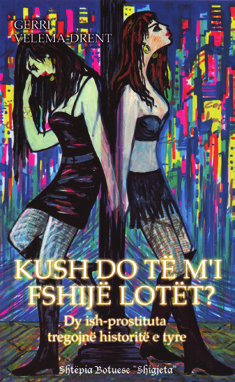 Kush do t� m�i Fshij� Lot�t? =>« 01194 · Edit Form · 01196 » Who Will Dry My Tears? Nga GerriVelema-Drent?, 120 faqe, botuar ne shqip nga Shtepia Botuese "Shigjeta" ne vitin 2000 ? Ana, from the Dominican Republic and Sarina, from Holland, were born into different worlds, yet their experience in life, its disappointments, poverty, desperation and loneliness led both of them to follow the same path which led to prostitution in Amsterdam. It is a world of tragedy, crime, addiction and sadness - a life which, they believe, has no way out. That was the experience of Sarina and Ana - two lives which knew deep pain until their lives changed. Shtepia Botuese: ScanpointSkopje? Printer: ScanpointSkopje?